Join us for the following events to connect with the local home staging community, and gain insights to improve your business. If you are a service business, you might be focused on one thing . . getting more clients! It’s something so many businesses struggle with, especially in the early days. It often feels like such a grind, and it can be tough to put ourselves out there again and again, especially when we’re not sure we are getting the results we want. I get it, because I’ve been there! I had low rates, less than stellar clients, an erratic schedule . . . I felt like I was running all over town trying anything to get new leads and it was exhausting! But now I have a proven marketing system that I use to attract the right kind of clients into my world, so I can connect with them and convert them into paying clients. I call it The Dream Client Formula! In my brand new live workshop, I will give you step-by-step solutions to help you define, speak to and attract more clients. Not just any clients but your DREAM clients. The kind that truly value what you do, that pay on time, that send you business again and again. Yes, these Dream Clients do exist! They’re out there and they’re waiting for you to serve them. But first you gotta know how reach them. I invite you to join me on Thursday April 4th at Lux Furniture Rental in North York. 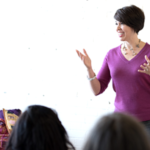 Lianne Kim is a renown Business Coach and an award winning public speaker. She has 20 years experience in sales and marketing and runs a network of over 240 small business owners in Toronto. She specializes in helping small businesses grow their sales by implementing simple yet effective systems and practices. If you are interested in registering for this event, please contact Lux at 416-444-0589 to book your spot today! Use The Lux Studio for a home staging event you can be proud of.